Do you have trigger words that jump out at you when you look at recipes online, in cookbooks or magazines? Certain ingredients that stand out in the recipe index, name, or description that make you take a closer look. 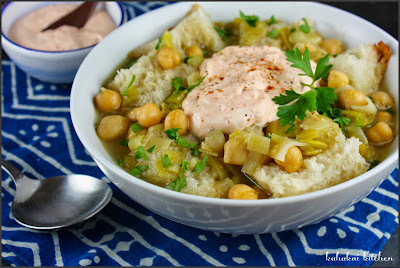 On my short list--beyond the very obvious soup of course--there is chocolate (and any pairing of it with sea salt and/or caramel), tarragon, fried egg, avocado, and four ingredients that happen to be in this week's soup recipe--chickpeas, leek, cumin, and harissa. 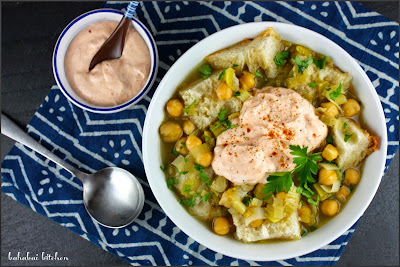 Which is why it is surprising that this recipe for Chickpea, Bread, and Leek Soup with Harissa and Yogurt from the April 2010 issue of Cooking Light, took me so long to make. I had it in a stack of recipes to try and just came back across it the other day and it immediately jumped to the top of the list. Cooking Light says, "This hearty Middle Eastern-inspired soup is based on a favorite at Garden State Cart (a Portland, Oregon food cart). Look for harissa--a fiery North African condiment incorporating chile peppers, tomatoes, and paprika--in tubes and cans at ethnic grocery stores and specialty shops." I made a couple of small changes to the recipe--namely increasing the chickpeas and garlic, reducing the sodium, and choosing to add the bread portion to a couple of the servings via the fun of sourdough bread bowls--because isn't a great soup made even greater by a bread bowl?! My changes are noted in red below. Remove roots, outer leaves, and tops from leeks, leaving white and light green parts of each leek. Cut each leek in half lengthwise. Cut each half crosswise into thin slices. Rinse with cold water; drain. Heat olive oil in a large Dutch oven over medium heat. Add leeks to pan; cook 10 minutes or until tender, stirring frequently. Add cumin and garlic; cook for 1 minute. Add chicken broth and chickpeas; bring to a boil. Reduce heat to medium-low, and simmer 15 minutes. Stir in parsley. Place about 2/3 cup bread in each of 6 bowls; ladle about 1 1/3 cups soup over each serving. 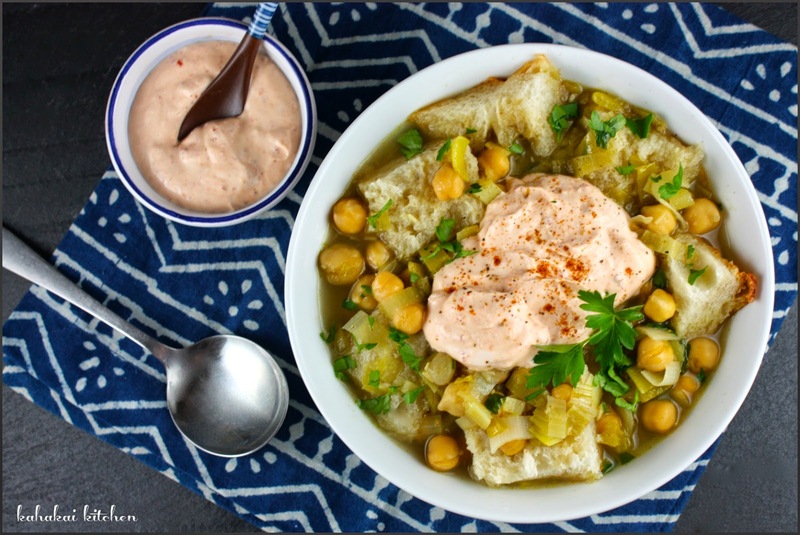 Combine 3/4 cup plain low-fat yogurt and 6 teaspoons harissa in a small bowl. Top each serving with 2 tablespoons yogurt mixture. Notes/Results: A relatively quick soup to make with not a lot of ingredients but plenty of flavor. 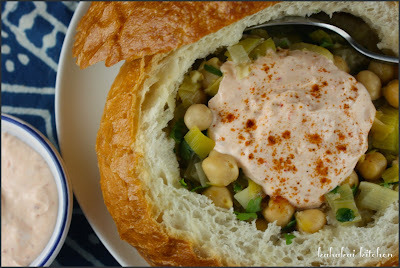 The sweetness of the leeks with the nuttiness of the chickpeas first, then the heat from the spicy harissa yogurt kicks in--a fantastic combination. 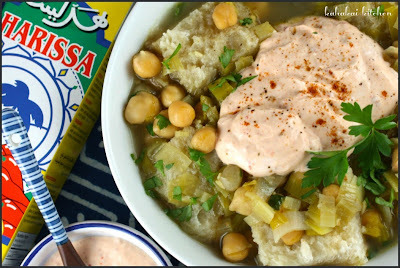 (And BTW harissa yogurt is a very good thing--I will be making it a lot I think for soups, salads, veggies and fish.) 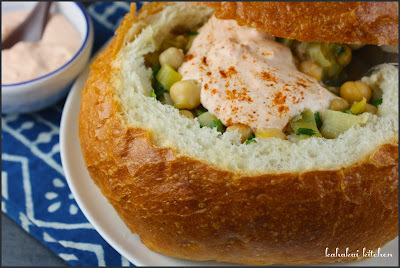 The chickpeas and the bread--whether in chunks, or with the soup served in a bread bowl, help make it very satisfying. A pretty wonderful soup all around except for the sodium content which is pretty high. I reduced it a bit by using homemade almost-no-salt veggie broth in place of the chicken stock and using no-salt chickpeas too. With the extra garlic and the cumin, there was still plenty of flavor. I will make it again. Janet of The Taste Space is here with me today in the Souper Sundays kitchen, sharing this golden-hued Coconut Cabbage and Lentil Soup with Cilantro. 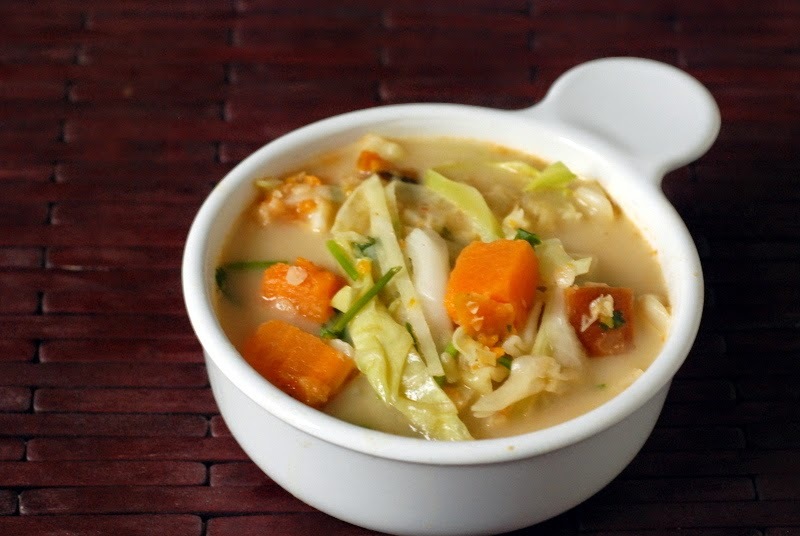 Janet says, "The coconut-infused broth is silky smooth with spicy hints of sriracha and ginger, balanced by the lime juice and cilantro and packed with good-for-you veggies like sweet potato and cabbage. Oh, and there are red lentils in there to make this a complete meal. The cabbage was fun because they were inadvertently like noodles with their long strands. Dig in!" Thanks to Janet for joining in this week. If you have a soup, salad, or sandwich that you would like to share, just click on the Souper Sundays logo on the sidebar for all of the details. Harissa is one of my words also! This is heading straight to the top of my MUST HAVE list.